Zener diode is like a normal diode, but instead of being destroyed by a big reverse voltage, it lets electricity through. The voltage needed for this is called the breakdown voltage or Zener voltage. Because it can be built with a known breakdown voltage, it can be used to accurately measure voltage. 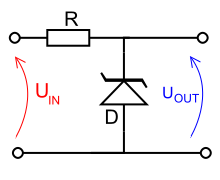 Wikimedia Commons has media related to Zener diodes. This page was last changed on 14 May 2014, at 10:13.